"O M W," he texts me. It would have been cryptic and uncrackable if he hadn't just warned us. "I'll text you when I'm on my way," he had said, his eyes flashing excitement, hair freshly-cut, the ring safely tucked away. "They're on their way," I called out to Mark, Daniel, and Morgan. Grabbing my camera, I dashed outside, bare feet trampling warm spring grass. "Isn't it like a twenty minute bike ride, Mom?" Morgan asked. "I don't mind." I wandered in my front yard, soaking in the seventy degree sunshine, stroking red tulip heads and brushing fingers through velvety hedge growth. And then they were in view. 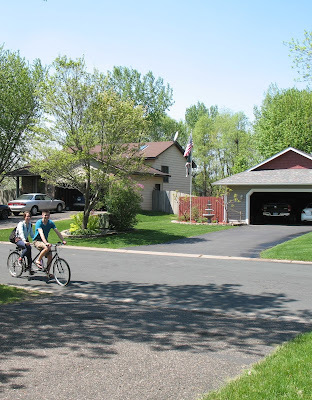 John and Kate, cycling on the borrowed tandem bike, faces giddy and flushed with excitement, turned into our driveway. Kate's face was still red and tears slipped down. She grinned, shyly wiping them, and her diamond ring caught the light. "Congratulations! Let's see the ring!" 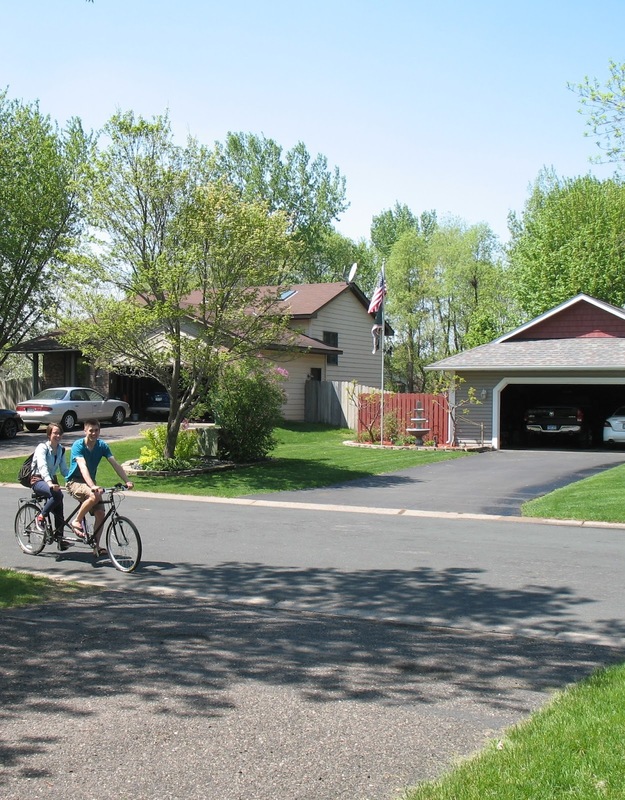 They giggled and stepped off the bike, standing arm in arm. Mark, Morgan, Daniel and I took turns hugging our eldest son, John, and his new fiancee, Kate. I snapped photographs like a madwoman. That night after the dozens of phone calls to the relatives, after our two new families merged for an impromptu family grill-out of hot dogs and watermelon, and after praying aloud on the back deck for the new couple, everyone went home, and an emotional happy silence fell on the house. "Mom, do you know about Jewish weddings?" John asked, towering over me at the sink as I washed hands. With neither family Jewish, his question surprised me. "Well, my grandpa performed a Jewish wedding for my cousin years ago..." I trailed off. "Well, I've been learning about this somewhere. Did you know in some Jewish customs the bridegroom had to go to his father's house and prepare a home for his wife before he could marry her?" Sudden word pictures sank in deep to me. "We're like the bride," he said, and the beauty of it surged clearer to me. Jesus's words in the biblical book of John chapter fourteen rang in sharper meaning for me suddenly. Jesus talked about the rooms in his Father's house, and about going there to prepare a place for us. "And if I go to prepare a place for you, I will come again and take you" with me so that we can be together there, he said. It strikes me that we're all the pretty, shiny red-cheeked fiancees, and our Beloved is coming soon. Dear Jennifer ... what a sweet, sweet joy for you and your family. Jennifer, congrats!! What an exciting time for you all! Mother of the groom now, huh? You'll have to keep an eye on my Mother of the Bride Blog and even my book coming out July 1. You might find something helpful in those, too! :) Blessings to you all! Congrats to you two and also to them. My oldest has never been married and my youngest has will celebrate #12 in a couple weeks. nothing like the joy of watching them fly the cuckoos nest. I mean, the home. :) Praying God shines brightly in their home. Congratulations!!! So happy for you and them, your entire family! Thank you for sharing about Jewish customs about marriage. It really adds insight and power to Christ's word. Anytime I learn more about the culture in Christ time it adds value to the Scriptures. I wish I could take a class to learn more about Biblical time and culture. I think my western culture inhibits some of the deeper meanings in the Word of God.